One year after Chancellor William McRaven laid out his Quantum Leaps Initiative, UT System regents bought in big at their meeting Thursday. One year after Chancellor William McRaven laid out a series of ambitious projects that he said would fulfill his vision for the UT System, regents on Thursday approved a nearly $60 million plan to accomplish those goals. The nine-member board approved shifting unspent money from existing projects to McRaven’s Quantum Leaps Initiative. They earmarked $41.3 million of the money Thursday and set aside the rest for future use, according to a spokeswoman for the UT System. The initiative unveiled by McRaven last November includes nine system-wide goals ranging from developing a "health care enterprise" to establishing the UT System as a leader in national security. McRaven said he hopes the program will allow the UT System to address system-wide problems with resources to determine if goals are being met. “What makes a quantum leap a quantum leap is that we are investing a lot of time and effort in a very disciplined process,” McRaven told the board Thursday. System officials presented reports on three initiatives that involve a five-year plan to close the gender pay gap for faculty, promote diverse candidate interview pools and ensure that students can pay for their tuition before opting to drop out of college. However, McRaven did not update the board on the project's most controversial initiative: the system’s expansion to Houston. “The Houston expansion really is about ensuring that we have a better opportunity to collaborate, innovate, research in the Houston area,” he said during a brief outline of his nine categories in the Quantum Leaps Initiative. The University of Houston has long opposed a UT System expansion into the Houston area. Last November, the UH System Board of Regents denounced the idea, calling it a “Trojan horse” and passed a resolution expressing “concern.” The resolution also called on the UT System to give the UH System a share of billions of dollars that it receives from the state’s Permanent University Fund if the plans continue to move forward. In February, McRaven instructed a task force made up of regents, business leaders, students and faculty to explore an expanded presence in Houston. The board also discussed the UT System's priorities for the upcoming Texas legislative session, which include maintaining campus presidents' authority to establish gun-exclusion zones, re-evaluating the effectiveness of the state's Top-10 Percent law and continuing to allow certain undocumented immigrants to pay in-state tuition. Chancellor Bill McRaven is requiring that a woman or minority candidate be interviewed for every high-level position at the UT System's 14 universities and medical schools. University of Texas System Chancellor Bill McRaven argued in two separate public appearances that the state should consider scrapping its top 10 percent automatic admissions rule. 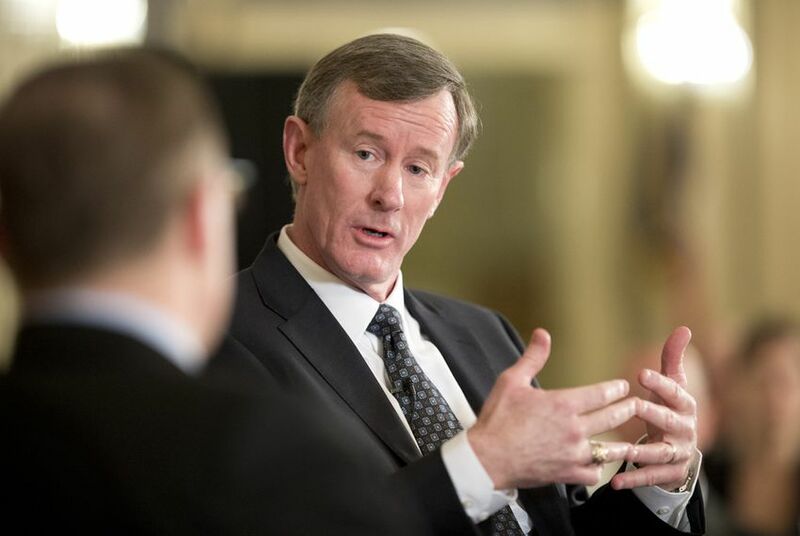 University of Texas System Chancellor William McRaven said that providing in-state tuition for undocumented students is the "morally right thing to do."